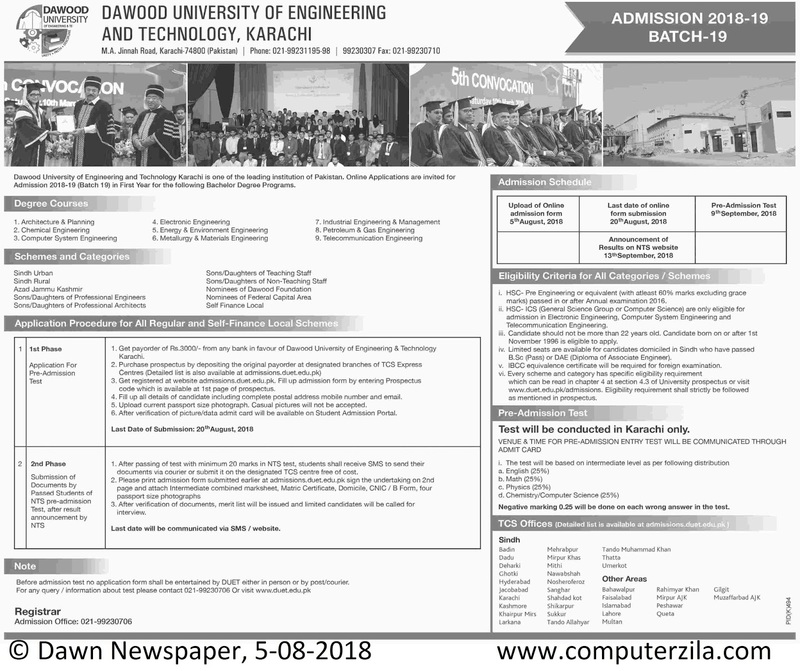 Admissions Open at Dawood University of Engineering and Technology's Main Campus, Karachi for the batch Fall 2018. DUET offers admissions in different fields of study for Bachelor Programs. Admissions Open at DUET for Session 2018-19 for Batch-19, Dawood University is one of the oldest Engineering institute in Karachi. Online applications are invited for admission in first year of bachelors degree programs. Test will be conducted by NTS. Candidate should not be more than 22 years old. University DescriptionThe Dawood University of Engineering and Technology (initials:DUET) (Sindhi: انجنيئرڱ ۽ ٽيڪنيڀياس جي جامعہ دائود‎) is a public university located in the industrial area of Karachi, Sindh, Pakistan. Established in 1962 as a public university, its initial financial endowment and foundation stone of the Dawood College of Engineering & Technology was laid by the former President of Pakistan (Late) Ayub Khan in 1962. The university was established by Dawood Foundation under the supervision of Seth Ahmed Dawood in 1964. It is regarded as one of the oldest institutions of higher learning in engineering and science, and offers undergraduate programmes in engineering and architecture. It is one of the notable institutions in Karachi and secured its place in the engineering category by the HEC, as of 2010.